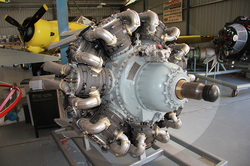 The Bristol Hercules is a large sleeve valve twin row 14-cylinder air-cooled 1375 horsepower radial engine. First used in 1939 as a 1290HP engine and eventually developed in post war to 1735HP, it was designed and built by the Bristol Engine Company. The Bristol Aeroplane Company was created in 1910 as the Bristol and Colonial Aeroplane Company and constructed a series of pioneering military aircraft including the Bristol Boxkite, Bristol Scout and Bristol Fighter before becoming the Bristol Aeroplane Company and building the interwar Bristol Bulldog bi-plane fighter and the WW2 Bristol Blenheim, Beaufort and Beaufighter, the later two designs also being licence built by the Australain Government's Department of Aircraft Production (DAP). In addition to their successful aircraft design and construction, Bristol developed a series of engines to power their own designs and the designs of other British Manufacturers including the successful 9 cylinder 465HP Jupiter engine of 1929 and 9 cylinder 560HP Mercury before concentrating on their unique sleeve valve design that produced a successful range of high power radial engines during and post World War II including the 14 cylinder 1065HP Taurus, 14 cylinder Hercules and 18 cylinder 2520HP Centaurus. The rationale behind the sleeve-valve design was to provide optimum intake and exhaust gas flow in a two-row radial engine. The arrangement of the cylinders in two-row radials made it very difficult to utilize four valves per cylinder and all non-sleeve valve two- and four-row radials were limited to two valves. The Bristol Engine Company was created as a subsidiary in 1939 and merged with Hawker Siddeley's aircraft engine division in 1960 to form Bristol Siddeley, which was taken over by Rolls Royce in 1966. The Hercules engine was designed by Bristol in 1939 and had evolved from earlier 9 cylinder 500HP Aquila and Perseus single row sleeve valve radials released in 1933, the cylinders of the Perseus were used for the 14 cylinder Hercules. It was used primarily on British military aircraft, including the Short Sterling, the Avro Lancaster mark III and Handley Page Halifax wartime 4 engined Heavy Bombers, and the Vickers Wellington twin engined bomber. Other uses were the Short Solent development of the Sunderland Flying Boat and the post war Bristol Freighter, Handley Page Hastings and French Nord Noraltas. However the most prominent use of the Bristol Hercules was in Bristol's own Heavy Fighter development of the Bristol Beaufort Bomber - the Bristol Beaufighter. The Beaufighter prototype flew in 1939 only 8 months after the design was started by using the earlier Beaufort Bomber as the basis of its design. Both Bristol built and Australian DAP built Beaufighters saw service in Australia, and while the Beaufighter was built locally under licence by DAP, its engines were imported from the UK. The Museum's display engine is a Bristol Hercules 734 from a post war Bristol Freighter similar to the Bristol Freighter VH-ADL in the museum collection which has 2 Bristol Hercules 734 still fitted. The Museum also has two Bristol Hercules XVIII installed in its rare DAP Beaufighter A8-328.